My intention was to read The Traitor's Heir without hurry. I was busy with the preparations for the beginning of the semester, but decided to start reading the novel at least. The truth is that I could not leave it until I had finished it. 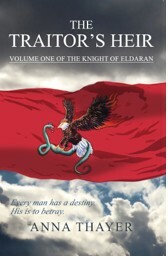 This is the first book published by Anna Thayer, the first of a fantasy trilogy called The Knight of Eldaran that we hope to see complete in bookshops very soon. The story lacks nothing that makes a text entertaining: adventure, romance, dangers and treasons. It confidently stands its ground with other successful sagas. Divided between two opposing and conflicting worlds -that of the king and that of the throned, his usurper - the young Eamong will have to choose his own destiny and the kind of man he wants to be. A classical tale about the fight between good and evil skillfully narrated by this graduate from Cambridge University. The Traitor´s Heir is your first novel. How was the process of writing it? Is it very difficult for a new author to get published? They always say that writing a novel is the easy part; certainly, that was my experience of it! I wrote The Traitor’s Heir and its two sequels over the course of about a year, whilst I was living and teaching in Palermo; perhaps the Mediterranean was particularly congenial to imagination (or maybe it was just the lovely weather and exquisite food!). Editing the novels was a far more laborious process, a work of both love and hate, rejoicing and tears. It took (and takes still – for I am yet to finish editing part three of the trilogy) a conscious and dedicated effort to take a story from the first spark of its existence to a completed, publication-worthy manuscript. And, once the books is published, I find it very difficult to pick it up and look at it again; whenever I do, whatever page I turn to, I always see odd things that I think ‘I could do that better’. In that sense, a story is never static or completed for a writer, but always transient and growing in its imaginative space – a space that, on publication, it also gives to its readers. I found the process of getting published quite difficult – there was a great deal of rejection before acceptance. The clash of the vulnerable author, offering the fruits of their imagination, and the demands of world of business, can be heart-breaking for the former. Perseverance is absolutely the only way forward. Why did you decide to write a fantasy trilogy? What attracts you to this literary genre? And what do you think that you can contribute to it? I’m not sure I really consciously ‘decided’ to write a fantasy trilogy – more, I decided to write a fantasy story that was ultimately too long to be published in one volume. I’m not the first to suffer from this problem, and am sure I won’t be the last! I also don’t know how conscious an author can be about an act of creation – the story more imposed itself upon me than I summoned it out of nothing. For me, the draw of this genre has always been in the liberating power of imagination. I’m very much of Lewis and Tolkien’s school of thought in the matter: fantasy is a vehicle through which our experience can be enriched and renewed, through which we can experience something beyond ourselves. As to what I can contribute to the genre – perhaps the best thing I can hope to do is have a story worth telling, a story that will be meaningful to its readers, and maybe explore some avenues of the genre that have not been explored before. I’d like to be able to enrich and renew my readers, to give them, as Tolkien would put it, a sharpened taste for their own world. You do not write only fiction, you also write critical papers on fantasy authors. Does this other aspect of your work influence your writing? My critical work very much impacts on my writing -I don't think a writer should be divorced from the more critical aspect of the world of literature. I've found that the more I read and think about what I read, and the more I engage with the thoughts of other writers, the sharper my own writing becomes. Interacting with the themes, images and theologies of other writers and critics (something I also very much do in my job as a teacher of literature) helps me to cast my own work. An unavoidable question: who are your biggest literary influences? An unavoidable answer: J.R.R. Tolkien! Lewis has also played a big part in shaping my creative response. As a student and teacher of English literature, I also have to acknowledge the impact of my literary ‘idols’ – Shakespeare, Milton, Owen to name but a few. A good writer is, I think, always interacting with the great wordsmiths of the past and present. When will the second volume of the trilogy be published? I am now looking for a publisher for the second volume (The King’s Hand), while my wonderful husband is helping me to edit the third volume to follow in its footsteps. What was your aim when writing The Knight of Eldaran? Did you have a particular vision of what you wanted to say with your work? My aim in writing this novel was really to explore what it means to be ‘in the world, but not of it’. Ultimately, it’s a trilogy about choice: making a choice, stepping into the fullness of that choice, and holding fast to it even in times of darkness. I think, in our rather post-modern age of relativism and ‘anything goes’ that we sometimes need to take a step back and look at objective ideas and the impact that they have on our lives. The value and necessity of moral choice is something I feel we forget. I hope that, through sharing Eamon’s misadventures, readers will be able to reflect on their own lives in a way that is meaningful and applicable to them. Do you have other projects in mind? Will they also be fantasy novels? I’m hoping to be able to write the ‘prequel’ to Eamon’s story one day – to detail exactly how the throned gained control of the River Realm. Clearly, this will also be a fantasy novel – though I think a much darker one than The Knight of Eldaran. After that, I may try my hand at something other than fantasy. We’ll just have to wait and see!